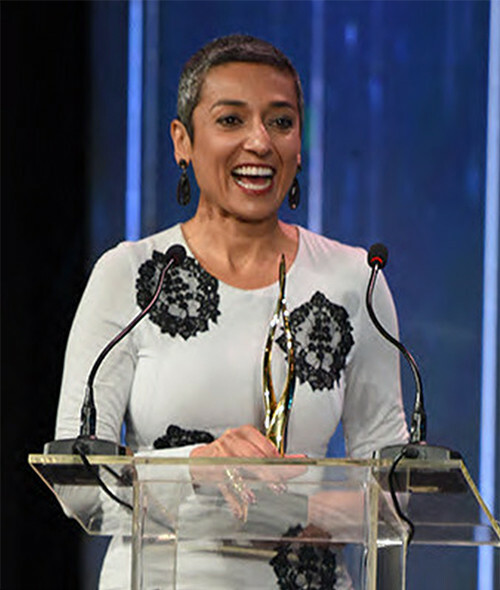 Mrs. Zainab Salbi , at the age of 23, founded Women for Women International, a grassroots humanitarian and development organization dedicated to helping women survivors of wars rebuild their lives. Under her leadership as the organization’s CEO (1993-2011), the organization grew from helping 30 women upon its inception to more than 400,000 women in 8 conflict areas leading to a distribution of more than $100 million dollars in aid and loans, and it has impacted more than 1.7 million family members. Salbi is the author of the national bestseller “Between Two Worlds: Escape from Tyranny: Growing Up in the Shadow of Saddam” (with Laurie Becklund), “The Other Side of War: Women’s Stories of Survival and Hope”, and “If You Knew Me, You Would Care.” In 2015, she launched the Nida’a Show, a talk show dedicated to inspiring women in the Arab world, where it airs in 22 countries with TLC Arabia. Currently, she serves as Editor-at-Large at Women in the World Media in collaboration with the New York Times and recently announced The Zainab Salbi Project with AOL/Huffington Post. Zainab was named a Young Global Leader by the World Economic Forum. In 2010, President Clinton nominated her as one of the 21st century heroes as featured by Harper’s Bazaar, and she is a member of Clinton Global Initiative led by President Clinton. She has also been identified as one of the most influential women in the last several years by Newsweek, The Guardian, Fortune Magazine, and Harper’s Bazaar. Most recently, Salbi was featured on Fast Company’s list of 100 Most Creative People in Business for being a voice of change in the Middle East (2016) and Ranked #2 on Arabian Business’ list of The World’s 100 Most Powerful Arab Women (2016).